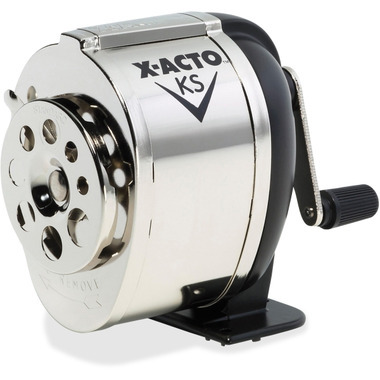 X-ACTO Manual Pencil Sharpener features solid steel gears and X-Acto hardened steel cutters. The pencil-saver prevents oversharpening and the positive-lock pencil guide adjusts to sharpen eight sizes of pencils. This pencil sharpener includes steel nickel-plated receptacle, mounting screws and metal stand.